On Feb. 3, at approximately 8:40 p.m., Assistant Principal of Activities Josh Lamar, tackled a Fountain Valley High School (FVHS) student after a home basketball game when the student revealed a fake gun in his possession. 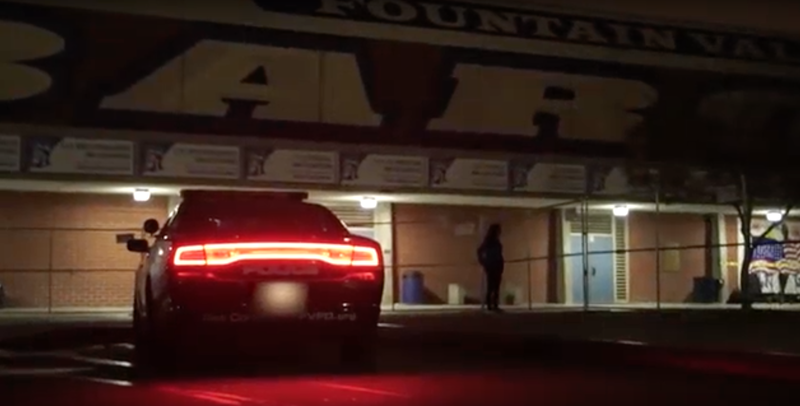 The Fountain Valley Police Department arrived at 8:45 p.m. as the school’s janitors and Lamar did a routine pat down on the student. The student was safely detained. Because there was going to be a dance after the game, the students who remained were rounded up into the school’s cafeteria so Principal Morgan Smith, Ed.D., could explain the situation. “Unfortunately, we have a student tonight that made a terrible, terrible mistake. He brought something to our gym, to our school, that he shouldn’t. Something that looked very serious and very real but it turned out that it was not real. But it looked the part and we treated it as the part. We treat it as the situation. When we rise to that height and level, it makes us do a gut check… Which means that we are going to get a hold of real mom and dad to let them know what happened and why we [canceled the dance]. I would much rather you be safe than have any kind of worry,” said Smith. The dance was cancelled and student dance tickets were refunded on Monday. Some students thought strongly against this cancellation but understood the circumstances. “Well, first when he said it, that the dance was being cancelled and everyone should go home, I thought he was joking but it actually ended up being true. I’m pretty bummed out about it, that shouldn’t have happened. Whoever brought that gun, that fake gun, whatever it was, shouldn’t have done that either. So I’m pretty bummed out about that but it’s about safety so I guess that’s important,” said senior Gaganjyot Arora. Other students expressed the same concerns. “Personally, I’m really disappointed because I was really looking forward to the dance, but I guess that for everyone’s safety I can understand why they decided to cancel it,” said junior Allen Ninh, a student from Bolsa Grande High School. After closing off the campus, Smith sent out a phone call to all households to explain the basic situation why the dance was canceled, Assistant Principal of Supervision Marc Trocchio sent a phone call to the student’s parents and Lamar stayed back with the Associated Student Body (ASB) students to clean up the area. “It’s really sad how we had 300 to 400 kids who wanted to have a good wholesome Friday night and unfortunately an action of a young man who made a very poor choice ruined it for everybody. So we feel very sorry about that but you guys are awesome. You know, not many schools would behave the way you guys did in the cafeteria and we’re so proud of that,” said Trocchio. AP vs. college classes– Are they worth it?